Founded in 1900, the Philadelphia Orchestra performed at the Academy of Music at Broad and Locusts Streets until 2001 when it moved to the newly constructed Kimmel Center for the Performing Arts. In 1986, the orchestra and its supporters announced formal plans for a 3,200 seat hall on the southwest corner of Broad and Spruce Streets. The next year, the orchestra’s board selected local architects Robert Venturi, John Rauch, and Denise Scott Brown to design the new building. The hall was expected to be finished in 1992 at a cost of $60 million. Highlighted by a soaring 150-foot, glass-vaulted rooftop, the Kimmel Center for the Performing Arts is home to eight resident music and dance companies and presents a wide range of artists from around the globe. Verizon Hall, the center’s cello-shaped 2,500-seat main-stage theater features adjustable acoustical panels and is home to the Philadelphia Orchestra. The smaller 650-seat Perelman Theater features a rotating stage that easily adapts to chamber music, dance, and drama performances, while the SEI Innovation Studio provides a place for experimentation and new works. 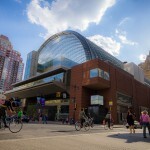 The Kimmel Center for the Performing Arts was designed as the centerpiece of the Avenue of the Arts, a rebranded stretch of Broad Street devoted to performing arts venues. Built by a partnership of public and private entities, the Kimmel Center was part of a wider plan to revitalize Center City via the construction of new entertainment attractions. Since it opened at Broad and Spruce Streets in 2001, the Kimmel Center has attracted visitors from across the region to music and dance performances on Philadelphia’s revitalized arts corridor. 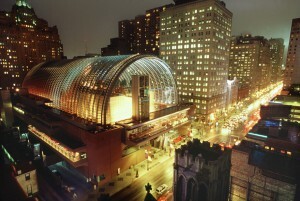 The Kimmel Center continued to face criticism in the years following its opening in 2001. The roof garden, intended to serve as a revenue-generating events space, required extensive renovations. 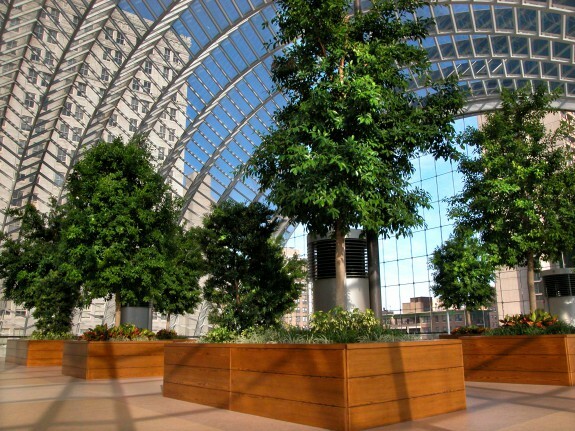 In the 2010s, work began on enclosing the garden in a glass sheath to improve its climate control and sound isolation. 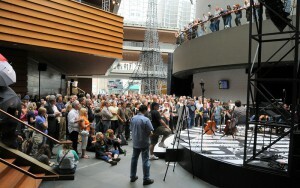 Not all entertainment at the Kimmel Center for the Performing Arts takes place in its main concert halls. 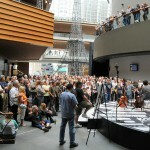 To attract the public and cultivate supporters, the Kimmel Center lobby is open to the public and is often the site of performances and other events, including this appearance in April 2011 by singer-songwriter Dunkan Sheik during a free midday concert sponsored by radio station WXPN. Since the 1970s, various institutions had tried to generate interest in building a flagship performance facility on South Broad Street. 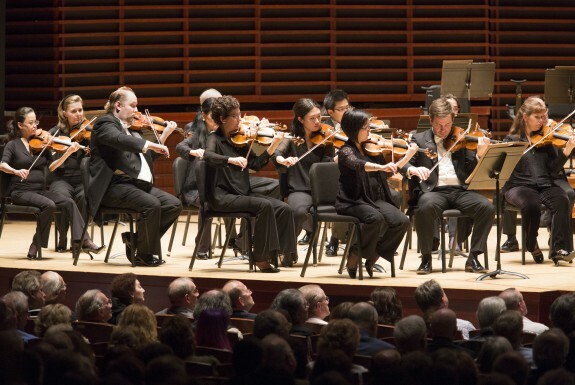 Proponents of a new concert hall argued that the Academy of Music, the mid-nineteenth-century building that was home to the Philadelphia Orchestra, Opera, and Ballet, was undersized and overbooked. In 1977, the Old Philadelphia Development Corporation (OPDC) established the Avenue of the Arts Council (AAC) under the direction of Richard S. Ravenscroft (1938-2013). 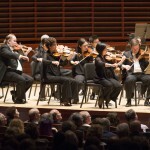 The AAC was charged with helping to promote Broad Street as a performing arts destination and study the feasibility of constructing a roughly 3,000-seat performance hall for the Philadelphia Orchestra. In 1986, the Philadelphia Orchestra and its supporters announced formal plans for a 3,200 seat hall—this time on the southwest corner of Broad and Spruce Streets. The next year, the orchestra’s board selected local architects Robert Venturi, John Rauch, and Denise Scott Brown to design the new building. The hall was expected to be finished in 1992 at a cost of $60 million. By 1989, when their plans were revealed, the cost had risen to $95 million and the expected completion date pushed back to 1993. The public was unenthusiastic about the design, and fundraising proved slow: by 1992, the orchestra had only raised $24 million towards construction. As enthusiasm and fundraising for the project stalled in the mid-1990s, the orchestra board decided that in order to generate the necessary capital, the new facility would have to broaden its mission by including other local arts institutions. The project was the redubbed the Regional Performing Arts Center, and a new high-profile architect, Rafael Viñoly (b. 1944), was brought in. In 1998, Viñoly presented his soaring $203 million design, which included two additional theaters and open spaces for public events under a vaulted glass roof. The main 2,500-seat hall was to be lined with sinuous wood curves that resembled the body of a cello. It would be joined by a smaller second recital hall with a café and garden on its roof, along with a 200-seat black-box theatre. At the announcement, Mayor Edward Rendell (b. 1944) declared that the design would soon be hailed as “the signature building of our generation.” But cost overruns remained an issue; by the time construction began in November 1998, the price of the building had risen to $245 million. In December 2001, the 450,000-square-foot facility finally opened as the Kimmel Center for the Performing Arts, renamed to honor lead donor Sidney Kimmel (b. 1928). Philadelphia Inquirer architecture critic Inga Saffron (b. 1957) hailed the building, calling it a “bold, new treasure”—even if she was less enthusiastic about the use of drab brick for its exterior. Reviews of the main concert hall’s acoustics were also mixed. A decade after it opened, sound engineers were still tweaking the hall to improve its sonic resonance. 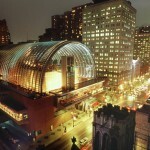 The Kimmel Center continued to face criticism in the years to follow. Its common spaces were decried as unwelcoming, and in 2008, design consultants solicited public input while preparing to remodel them. The roof garden, intended to serve as a revenue-generating events space, also required extensive renovations. 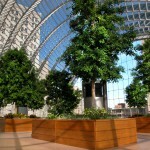 In the 2010s, work began on enclosing the garden in a glass sheath to improve its climate control and sound isolation. 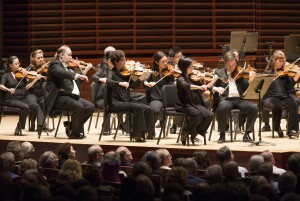 Ultimately, the Kimmel Center’s rocky reception only exacerbated the orchestra’s ongoing financial woes. Budget shortfalls and lackluster attendance forced the orchestra to shorten its seasons, cancel guest appearances, and periodically contemplate bankruptcy. In the years to follow, the Kimmel Center’s other resident companies—the Chamber Orchestra of Philadelphia, the Chamber Music Society, PHILADANCO, American Theater Arts for Youth, and the Philly Pops—joined the orchestra at the Kimmel Center. Although the new concert hall ultimately cost a staggering $265 million, it proved successful in generating economic activity. 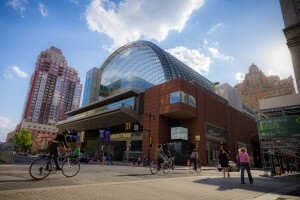 In its first three years of operation, the Kimmel Center added $321 million to the local economy, including $17 million in state and local tax revenue. Perhaps more importantly, the Kimmel Center helped to reestablish Philadelphia as a world-class destination for the performing arts. Dylan Gottlieb is a Ph.D. candidate at Princeton University, where he works on recent American urban history. Bounds, Anna Marie. “Philadelphia’s Avenue of the Arts: the Challenges of a Cultural District Initiative,” in Tourism, Culture and Regeneration, Melaine K. Smith, ed. Cambridge: CABI Publishing, 2006. Central Philadelphia Redevelopment Corporation. Remaking Center City: A History of the Central Philadelphia Redevelopment Corporation. Hannigan, John. Fantasy City: Pleasure and Profit in the Postmodern Metropolis London: Routledge, 1998. Greater Philadelphia Cultural Alliance Records, Urban Archives, Temple University, 1210 Polett Walk, Philadelphia. Kimmel Center, 300 S. Broad Street, Philadelphia.